I was reading the comments for my post "Joplin, Missouri" and although I believe all the comments were insightful and heartfelt, there was one by Mrs. Downhome America that gave me pause. Among other cogent points, Mrs. Downhome America implied that the devastation that occurred in Joplin may be an experience to "peel" away pride and other stumbling blocks. Here's an excerpt: "He knows what's important, and he's prepared to strip away things that aren't eternal to give us eternal, spiritual muscle. Brigham Young would say the saints had been "peeled'. All these things are meant to be for our good." Mrs. Downhome America's point is a challenging one. As I noted in my original post, I don't know the rhyme or reason for the tornados that impacted Joplin so tragically. 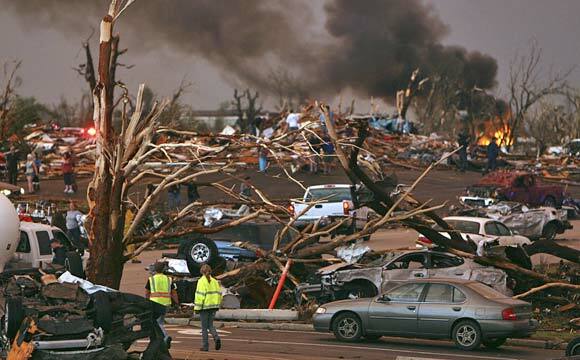 In reading the scriptures, I am conflicted as to the reason why the tornados hurt so many good people and destroyed so many homes, buildings, a hospital, and yes, the only LDS church building in Joplin. For example, in the Book of Mormon, the Anti-Nephi Lehies are brutally attacked by their former brethren. Even though the Anti-Nephih Lehies have cast away all of their sins and evinced their deep faith in Jesus Christ by burying their weapons of war, still one thousand of the new converts of Christ are mercilessly murdered while they are in the act of praying. See Alma Chapters 23 and 24. In Helaman Chapter 12, verse 3, Mormon seems to proclaim the reason for catastrophes and "acts of God," as we lawyers like to say in contracts: "And thus we see that except the Lord doth chasten his people with many afflictions, yea, except he doth visit them with death and with terror, and with famine and with all manner of pestilence, they will not remember him." Does this apply to all disasters and tragedies? Does this apply to Joplin? Jesus himself was tempted by Satan after having fasted for 40 days and 40 nights in the desert wilderness. Did he "deserve" this temptation or was it used by God to refine Jesus to become the Christ? Were Laman and Lemuel justified in persecuting, beating, and attempting to murder their brother Nephi or was Nephi being perfected and prepared to be the prophet of God? Was it because of Noah's wickedness that he had to preach for 40 years without converting one non-familial person or was Heavenly Father trying to sanctify Noah? And was Father Abraham unrighteous when Jehovah commanded him to sacrifice his son, Isaac, or was Abraham learning something about Abraham and his relationship with God? "Earth life includes tests, trials, and tribulations, and some of the trials we face in life can be excruciating. Whether it be illness, betrayal, temptations, loss of a loved one, natural disasters, or some other ordeal, affliction is part of our mortal experience. Many have wondered why we must face difficult challenges. We know that one reason is to provide a trial of our faith to see if we will do all the Lord has commanded. Fortunately this earth life is the perfect setting to face—and pass—these tests. But these trials are not just to test us. They are vitally important to the process of putting on the divine nature. If we handle these afflictions properly, they will be consecrated for our gain. Read the entire address - More Than Conquerors Through Him That Loved Us - here. So, is suffering indiscriminate? What's the difference between the suffering of the wicked and the suffering of the righteous? Are all trials for our perfection?